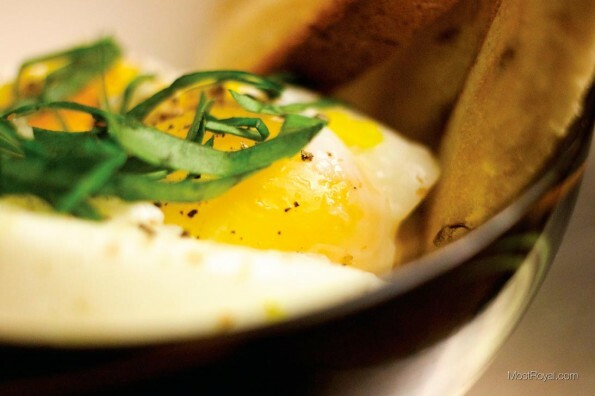 One of the hardest changes for us was finding time for simple things like breakfast. Each morning has become a tightly choreographed routine and most of the dance is focused on feeding the little one. I found my wife, Steph, reverting back to college living and eating bowls of cereal every morning, and then again for lunch and again at night before bed. As you might guess, Steph is not into cooking. She can make amazing food if you give her a recipe. She’s got a great binder full of cookies, cupcakes, lasagna, chicken curry casseroles and more but those aren’t exactly quick bites she can throw together. …nor are they healthy. So, I set about looking for healthy and filling alernatives to cereal. 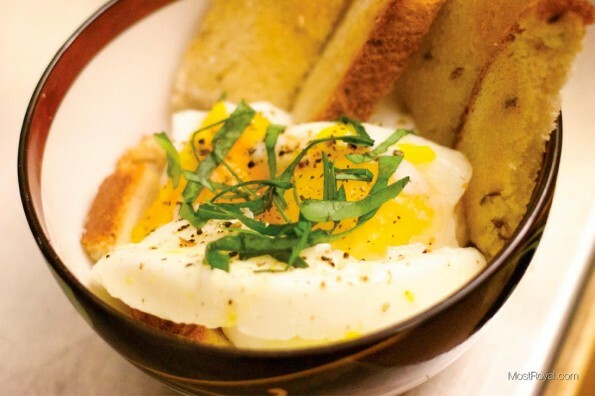 Today’s recipe is for super simple microwaved poached eggs. In the time it will take you to make toast you can have a delicious and healthy breakfast. The recipe also has super simple clean up allowing us to get right back to chasing our Little Prince as he toddles around. 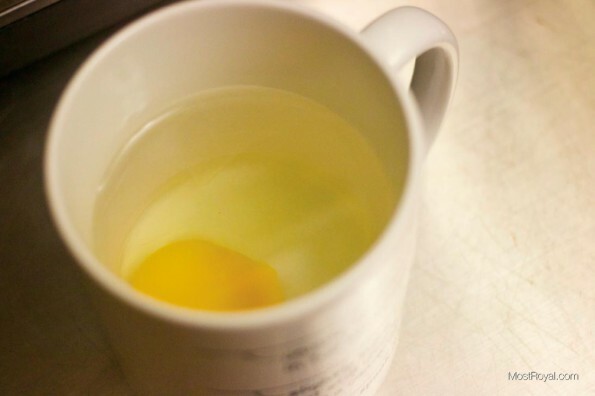 To make microwaved poached eggs you will need a coffee mug and an egg. 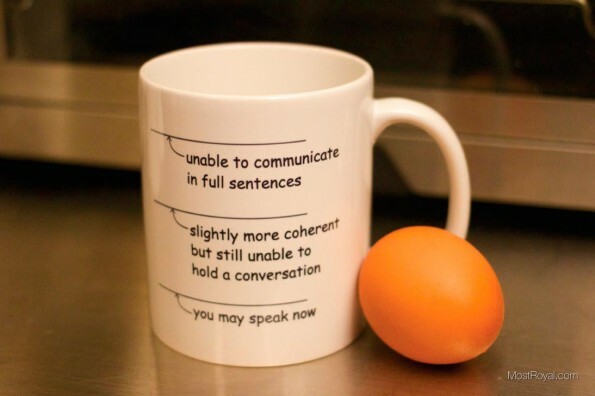 You can also make this with two eggs in a larger mug. Cooking times will be tricker though (more on that below). To be honest I usually make one egg, remove it and then cook the second. Maybe this is easier, or maybe I’m lazy, but I still finish cooking the eggs before the toast is done. Fill the mug halfway with water. Crack the egg open and add it to the water very carefully so that you do not break the yoke. Add a pinch of salt, if desired. I find doing so makes everything cook a bit more evenly. This is also when I toss some bread into the toaster. I like my poached eggs with rye bread. I can hear your concerns about clean up now. Don’t worry. When it comes to clean up you will be thrilled to know that when you dump this water there is almost zero residue left behind in the mug. A quick rinse, wipe of the inside and into the dishwasher it goes! Place the mug into the microwave and cook on high. The general rule of thumb is to cook your egg somewhere between 1 minute and 1 minute 30 seconds. 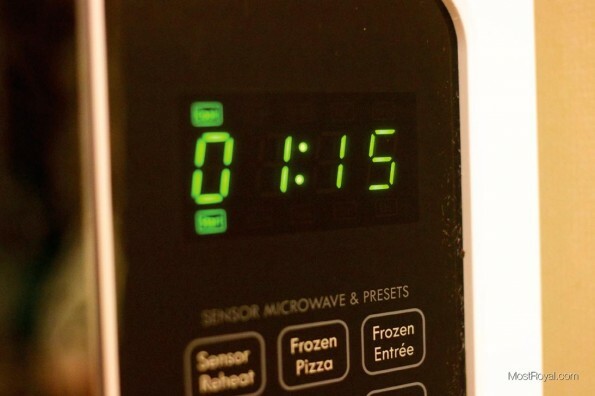 I find that 1:20 works great for my microwave. This is where things can be a bit tricky. If you don’t cook you egg long enough the whites will not have set. If you cook for too long the egg will “pop” shooting water and egg goodness all over the inside of your microwave oven. This is when the simple clean up stops being simple. Doh! You may also try cooking for 2 min at 50 percent power. This is really going to depend on a few factors such as the power of your microwave and the size of the eggs you buy. I also cook using the cold filtered water that we keep in our fridge. The first time you do this recipe you should be prepared for a potential mess so you might want to take this on after the little ones have gone to bed so you can experiment freely. Once you know the cooking time for your set up, you will be able to replicate it time after time. Round and a-round we go! 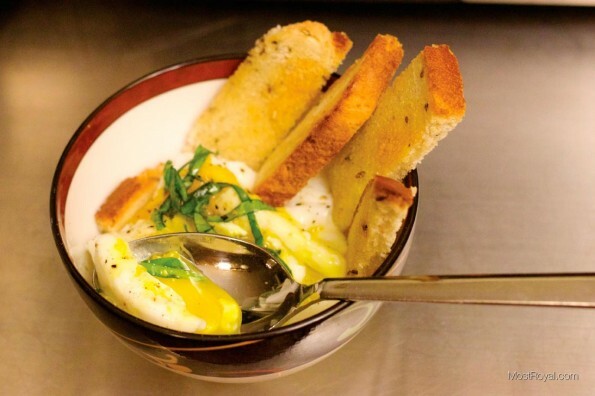 Using a slotted spoon or a large soup spoon carefully remove your egg from the water. Drain off any excess moisture and place on a plate or small bowl. This is also when I dump the water, refill and crack a second egg into the coffee mug. 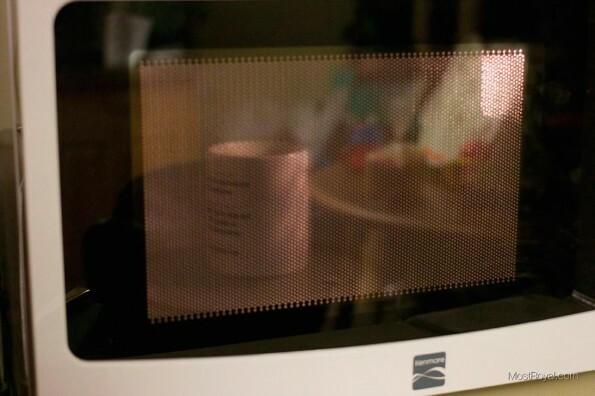 Back into the microwave it goes! If you are going to cook two batches make sure you dump the old water and pour fresh into the mug. Otherwise it will have a tendency to boil over due to the water already being hot. I tossed a little basil chiffonade on top for pretty pictures, but you don’t need to do this. Once the toast pops I cut it into strips and add to the bowl. Usually the toast pops right before my second egg finishes cooking. Add salt and pepper to taste. EAT! I’m not a food photographer, but you get the idea. 2 eggs with a slice of rye toast (no butter).